Do you ever notice who the “ new guy” in the office is? He is pretty easy to spot… He is always the one that cannot wait to begin each new workday. His step has a certain aura of “optimism”. Positivity surrounds him as he hums and “glides” through his tasks. He is always the person eager to tackle new assignments and his enthusiasm for new ideas and perspectives. He eagerly looks forward to establishing and growing new relationships with the rest of the team. He never seems to complain, nor is cynical and pessimistic. What ever happens to that person? How do they change? The change may take a week, a month or maybe even a year before their energy level drops and they get stuck. Have you ever viewed your progress through Anger Management in this light? Think back to those first few sessions when you were eagerly and passionately committed to achieving your anger goals. Think about the visions you had of renewed relationships with loved ones experiencing less tension and stress. Consider the enthusiasm you had for learning new techniques for constructive conflict instead of destructive arguing. Then, the burden of a new program and the steps involved begins to become noticeable. You might even have “fallen off the horse” with your anger a time or two. Suddenly those high hopes and visions start to fade and seem so far off and unattainable. They don’t have to be though. 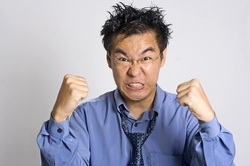 It is possible to sustain your enthusiasm and commitment to the anger management principles daily. With a renewed commitment to your goals you can re-achieve that passion and drive to be successful. With this renewed focus you can then begin to enjoy a profound peace and contentment that places life’s frustrations and anger pitfalls in a more positive focus. You begin to again see how situations that once angered and disappointed you now can serve as tools to help you grow in patience, self-restraint and graciousness. It’s almost like becoming that ”new guy” again. I challenge you to become that new guy once again. If you are one of those people who has experienced true emotional raging, you probably have come to know its frightening, powerful effects and consequences. You have probably asked yourself “Is there any way I can get a handle on this?” Now, we aren’t talking about your more common “getting angry for leaving the toothpaste cap off” kind of anger response. Rather, we are talking about those situations where you have lost complete control and may have even blacked out. You are in a situation where you feel like you aren’t even in “your body” but merely an onlooker “watching” from the outside as the RAGE is unleashed. These are the incidents that when you go to your anger management therapist, you conveniently “edit” to portray a more “conservative” account in order to avoid scrutiny. It is important to realize that yes, there is help, but we need to consider several points. First, when a person is responding with true rage, it is more than likely due to a past wound or sore spot that has been disturbed. Like any fresh wound, the more you scratch and disturb that wound, the more it will bleed. Anger Therapists frequently look for ways to identify “trigger mechanisms” - experiences or responses that stimulate raw, hurtful areas of one's personality resulting in extreme, often violent, reactions. When a person is beginning to experience these hurts, they need to remember they DO HAVE A CHOICE! Anger responses don’t necessarily have to lead to automatic reactions. No one “makes” us angry. Rather, it is persons practiced response to that trigger mechanism that leads to rage. Just as the response was “learned “ it can be UN-learned. It means choosing to adopt a peace of mind attitude instead of one of conflict and discontent that lead to rage response. Many people are familiar with the term “reciprocal thinking”. For people who wrestle with anger management this refers to that inner dialogue voice that erroneously plays over and over causing the rising anger response. It is the thoughts and reactions one hears on the inside while the anger scenario develops. One can sit and “stew” and play the dialogue over and over in ones head allowing the raw, sore wounds to eventually trigger a violent outburst OR a person can take the initiative to “re-program” the dialogue and practice “re-writing the script”. It takes a little effort but you are looking for an alternative way to deal with the situation. This means replacing the old, negative, aggressive, fault finding voice with one that is more understanding. One that is less conformational and more empathetic to the other person. In so doing you replace the old dialogue with one that helps AVOID escalation rather than promote it. It all comes down to the critical element of choice. Which response will YOU choose? Time after time I meet people who ask me if I can give them assistance with “their relationship.” When I begin to dig a little deeper, I hear things like “well, I just get upset when he/she does this” or, "it's his/her fault because they just know how to 'push my buttons.'" The really strange thing is… when I start to ask them what there reactions are, they are usually very tame, sanitized versions of what truly is occurring in the home. These instances drive home the point that to have any degree of effectiveness in an Anger Management program, there has to be an admission by the individual that a problem does indeed exist. Without the realization that a true problem exists, the results will always be the same, regardless of what anger management approach is used. Without acknowledgment of the problem, they just keep on being an angry person (only now with a head full of “pointless theories” that soon end up being used as defenses (“… Oh yes…I am familiar with the ------ approach, didn’t help me a bit!...”). All too often, the main motivator to seek anger management is that a loved one is threatening to leave the relationship, a court order, or an employer requesting that a worker seek assistance, or something similar which drives the anger candidate to seek assistance from “anger management.” But, usually it is a reluctant effort focused on appeasing the other individual(s), convincing them that steps ARE being taken to remedy the anger situation. To truly be effective in resolving anger issues, one MUST come to the realization themselves and acknowledge that a problem does indeed exist. There has to be a fundamental understanding that the responses the individual is having are inherently improper, threatening and unacceptable. This realization can come at any point, but definitely needs to be there prior to commencing successful anger management. How does one come to such a realization? I think more than anything, this comes from some deep soul searching. It takes seeking the council of loved ones and trusted close friends and asking the hard pointed questions. It takes listening to those around us when they tell us our responses are scaring them, and that they fear that our actions may someday result in harm to them or even us. It takes reflection on considering how many past relationships have been irreparably harmed due to anger incidents. Once an individual considers and believes these points, they will find that it IS POSSIBLE to turn their life around. They can see that life can take on a different light. They can begin to see that one doesn’t have to respond in a constant angry state or keep on having to make amends and repair damages from raging, hurtful outbursts. By a person acknowledging their problem, and then utilizing powerful anger management techniques, a person can "mange their anger" and enjoy the rich vibrant relationships they truly want deep down and ultimately live a healthy and fulfilling life. Don't Let Your Anger Manage You! Tips for Happy Anger-Free Holidays!! Well, we are officially into the 2011 holiday season. If you’re like most, this time of year always is exciting and uplifting. It also tends to be stressful and downright depressing! Why is that? How can a time of year as wondrous as the holidays be able to also cause some of the most stressful challenging emotional periods of peoples lives? I think a lot of it has to do with expectations. Many of us have the tendency to frame the context of the holiday season in what we have established as being the “best Thanksgiving” or “best Christmas” the family has ever had. One of my most favorite classic movies is National Lampoons Christmas Vacation. As Clark Griswold’s ideal Christmas crumbles with every tree branch burned up and broken ornament we find he was trying as hard as he could to forge the “hap-hap-happiest Christmas”. Unfortunately, as reality sets in, and disappointments mount, his “dream falls apart and he is forced to realize what the true meaning of the holidays are. For many of us its not so much that are expectations of the holidays are too high, no, in fact it’s the utter dread of having to deal with certain strained relationships and how to “just get through the holidays without an argument” In all of these circumstances its important to realize that stressors are elevated during holiday times. In anger management one of the key elements is learning to identify ones stressors or “triggers” so as to effectively be able to control anger and avoid confrontational situations. It’s extremely important to realize this fact that holidays present an increased challenge for controlling anger and ultimately allow for a more pleasurable and increased enjoyment of the time period. The following are just some recommended tips to make the recognition of potential anger triggers easier and ways to enrich the holiday experience with friends and loved ones. Learn to identify your trigger early: Anger, as an emotion, causes several physical changes by its very nature. Our muscles will tighten up, our voice will tend to get louder we start to become erratic in our thinking. Try and be pro-active to reduce potential life stressors. The holiday time period is notorious for causing us to become time compressed with increased tasks. But rather than being “reactive”, try and be pro-active and attempt to find ways to get ahead of tasks. It might mean maybe shopping earlier, or asking other family members for help getting things done, or even making a list and prioritizing tasks to help in getting to all of them. Try and change your perspective of the stress. If you think about it the only real reason that a stress is affecting us is our perception of how it is affecting our lives (a perfect example is when a driver cuts us off while driving and our perceived stress is one of being affronted at the drivers rudeness as opposed to maybe considering maybe the driver has an important appointment and is unsafely rushing or might be tired and not really concentrating on the task of driving. Stress guard your life: This means realizing that holiday times present increased opportunities for stress to wear on our bodies. In order to be effective in countering this we need to make sure we are up to the challenge by ensuring our bodies are fit. This means getting plenty of sleep. Take time to get in some exercise to work off those feelings of stress. Eating properly (which can be a challenge during the holidays but also can be done if one takes the time to focus on it) is important as well as staying well hydrated with water. Lastly, it’s paramount to watch ones consumption of alcohol. As a depressant, alcohol works contrary to the goal of reducing stress. It also reduces inhibitions and your ability to prevent anger reactions. Specializing in Anger Management, Career, Relationship & Life Challenges.